Transformative East Coast Rail Link secures mainland investment, enhancing connections to China-funded port. The East Coast Rail Link: Set to transform the economic prospects of Malaysia's less-developed regions. 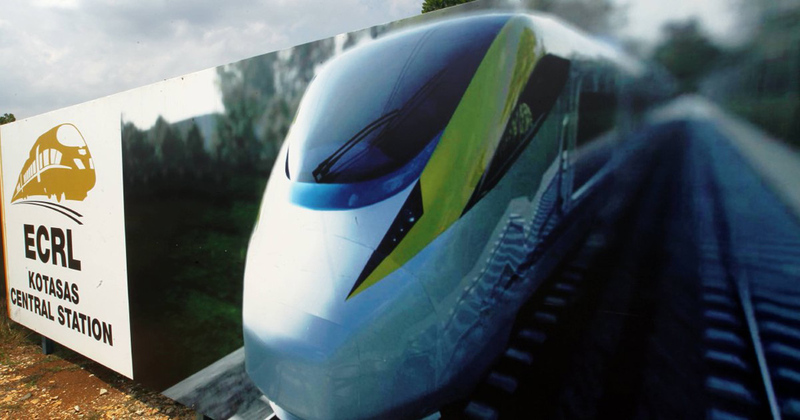 Work is set to begin on two of Malaysia's most ambitious infrastructure development projects – the construction of the East Coast Rail Link (ECRL) and a major upgrade to the Kuantan Deepwater Port. Both projects are being bankrolled by Chinese investment, with their development managed by two mainland-led consortiums, a sure sign that Beijing sees the programmes as an integral part of the Belt and Road Initiative (BRI), China's ambitious infrastructure and trade facilitation programme. The ERCL is one of the key planks in Malaysia's bid to economically rejuvenate its eastern region. With a proposed budget of some RM55 billion (US$13 billion), the 700km rail line is being constructed by the China Communications Construction Company (CCCC), the state-owned infrastructure development giant, and is expected to be operational by July 2024. Fully-electrified, the oxbow-shaped line will be built in two phases, ultimately connecting Port Klang on the west coast, the country's largest container port, with Kuala Lumpur, the Malaysian capital, while also servicing several urban centres and ports along the eastern seaboard. Its northernmost terminal will be Pengkalan Kubor, a strategically significant town on the Thai-Malaysia border. The line will carry both a 160 kph passenger service and a more sedate 80kph freight service. With 15 viaducts and 10 tunnels – the longest being 5.6km in length – 70% of the ECRL's capacity will be given over to freight services, with a throughput of more than 54 million tonnes of cargo anticipated by 2030. The remaining 30% will be allocated to the 5.4 million passengers expected to travel the route every year, making it the country's primary inter-regional transport system. The initial 600.3km phase of the project will run from the Gombak Integrated Transport Terminal in the state of Selangor to Kota Bharu, the capital of the north-eastern state of Kelantan. With 21 stops along the way, it will connect Kota Sas, Kuantan Port, Cherating, Kertih Port, Kertih Airport and Kuala Terengganu, the largest city on the east coast. The second phase will deliver two extension lines – a 24.5km northern link running from Kota Bharu to Pengkalan Kubor and a 78.6km southern spur connecting Gombak and Port Klang. In total, 85% of the funding for the project has been provided by the Export-Import Bank of China (EximBank) with the loan repayable at a rate of 3.25%. The remaining 15% has been sourced via Malaysia's sukuk Islamic bond scheme, an initiative managed by three of the country's domestic banks. Overall, developing the country's rail infrastructure has been designated as a priority by the Malaysian government and forms a key component of its economic transformation plan. This focuses on providing enhanced links between the country's eastern and western seaboard ports, while reducing the development gap between the west coast and the country's less-industrialised eastern states. It also seeks to remedy one of the country's most pressing infrastructure shortcomings. With the majority of Malaysia's inter-city rail lines running on a north-south axis, many of the towns, cities, ports and industrial zones in the country's eastern region have long been left solely reliant on road links. It is now hoped that the huge investment planned for the rail sector will bring it up to the standard of the country's existing port, air and road networks. Once completed, the ECRL is expected to jumpstart economic activity in the East Coast Economic Region, which extends across 51% of Peninsular Malaysia and is home to some five million people. It is hoped the new line will boost the region's per annum GDP by 1.5% annually for the next 50 years. Aside the from the economy of eastern Malaysia, the other key beneficiary of the ECRL is expected to be Kuantan, the state capital of Pahang and the site of the country's most significant east coast port. The port, which offers strategic access to the South China Sea, is currently undergoing a major upgrade. This will double its capacity to 52 million freight weight tonnes (FWT) and allow the largest container ships to berth. The first phase of the work on the port's new deep-water terminal is expected to be completed by the summer of this year, with phase two scheduled to go online in 2019. Already one of the country's prime conduits for imported goods and raw materials for industrial production and manufacturing, the expanded facility is also expected to handle a greater throughput of imported oil and gas. The redevelopment work on the port is being headed by the Kuantan Port Consortium, a joint venture between IJM Corporation Berhad, one of Malaysia's leading construction groups, and Beibu Gulf Holding (Hong Kong), a subsidiary of the Guangxi Beibu Gulf International Port Group, one of China's largest port development and management specialists. At present, ownership of the consortium is split on a 60:40 basis in favour of IJM, with the Malaysian government also having a special rights share. One of the key beneficiaries of the port's redevelopment will be the nearby China-Kuantan Industrial Park, the first Special Economic Zone to be jointly developed by Malaysia and China. At present, the park primarily focuses on power generation, energy-saving initiatives, environmentally-friendly technology, high-end equipment and the manufacturing of advanced materials.